Played high school baseball at Elizabeth (N.J.) High School ... Moved to the Dominican Republic in 2011 where he was signed as a non-drafted free agent ... Has a daughter, Aleyka ... Resides in Rahway, N.J. Missed the entire season following Tommy John ligament replacement surgery on his right elbow in February. Appeared in 12 games (five starts) in St. Louis going 4-1 with a 1.57 ERA one save and 52 strikeouts in 46 innings ... Made his Major League debut vs. CIN (8/9) in the 9th inning and struck out Adam Duvall as his first opposing batter en route to a perfect inning. It was his first relief appearance in professional baseball...Earned his first MLB win at CHI (8/13) throwing 3.0 scoreless innings of relief allowing one hit with three strikeouts...Struck out a batter in every start or appearance with a season-high seven over 6.0 innings vs. CIN (9/2)...Won three straight decisions (9/13-24) with two starts ... Surrendered one home run on the season, coming via Jung Ho Kang at PIT (9/7)...Threw a career-high 7.0 scoreless innings at SF (9/18), holding the Giants to four hits, two walks and struck out six...Earned his first MLB save at PHI (8/19), throwing a scoreless frame in a Cardinals 4-3 win in 11 innings over the Phillies...His 52 strikeouts were the most by a Cardinals rookie in his first 12 career games since Joe Magrane's 53 (81.2 IP) in 1987...His 1.57 ERA in his first 12 career Major League games was the best (min. 46.0 IP) since the Reds' Pat Zachry posted a 1.17 mark in 1976 and the best by a Cardinals rookie since Al Brazle's 1.50 mark in 1943. His ERA was also the lowest among MLB rookies (min. 46.0 IP)...Limited right-handed batters to a .170 average (16-94) with a .120 BA (9-75) with runners on base and .132 (5-38) w/RISP...Was 2-0 with a 2.20 ERA in five starts and 2-1 with an 0.52 ERA in seven relief appearances covering 17.1 innings...Did not allow a run through his first 13.1 innings, the streak ranked as the 3rd-longest in franchise history for a rookie to begin his career (Von McDaniel, 19.0 IP, 1957 & Pat Perry, 16.1 IP, 1985)...His first MLB start came vs. OAK (8/27), throwing 4.1 innings allowing one run in a no decision the Cardinals lost 3-2...Posted the 4th-lowest ERA (1.97) in the National League during the month of September (3-1, 32.0 IP)...Threw 4.1 scoreless innings in relief vs. CHI (9/13) in a 4-2 win, walking six. Marked the first time a Cardinals relief pitcher walked six or more in 4.1 IP or less and first with more than 4.1 IP since 1950 (Cloyd Boyer, 7.2 IP) at NYG at the Polo Grounds in a 2-0 STL win...Picked up his first hit with a single to right field off Trevor Williams (9/7) at PIT. Collected his first RBI vs. CIN (9/29) on a ground out scoring Aledmys Diaz...Was the first Cardinals rookie pitcher to tally two wins at Wrigley Field since Cris Carpenter (1989)...Named as the starting pitcher for the World Team at the All-Star Futures Game in San Diego. Struck out four batters over 1.2 innings (38 pitches/23 strikes)...Made 14 starts at Memphis (AAA) going 2-3 with a 4.96 ERA in 65.1 innings with 93 strikeouts...Ranked 2nd among Cardinals minor league pitchers with 12.81 strikeouts/9 IP...Rated as the Pacific Coast League's No. 1 prospect by Baseball America following the season. Also recognized as having the league's "Best Fastball" by league managers in the "Best Tools" survey by the same publication. Named Cardinals Minor League Co-Pitcher of the Year with Austin Gomber...named Cardinals Minor League Pitcher of the Month in April...selelcted to the Florida State League AllStar Game...named Top Prospect in the Florida State League by Baseball America...named Texas League Pitcher of the Week (8/10-17)...was selected to the Arizona Fall League Fall Stars Game, but did not pitch...combined to go 5-7 with a 2.49 ERA over 22 starts, fanning 151 batters in 101.1 innings pitched... ranked 12th in the Florida State League in strikeouts (96) despite making only 13 starts...struck out a career-high 13 over 6.0 innings vs. Dunedin (6/17/15), a mark that was T4th among all minor league pitchers in 2015....led Cardinals Minor League pitchers in strikeouts (151) and strikeouts/9 IP (13.41) while ranking in the Top 10 in games started (22, T8th), ERA (2.49, 5th), opponent BA (.197, 2nd) and Toughest to HR Off (414.0 TBF/HR)...made four starts for Surprise in the Arizona Fall League going 0-1 with a 3.60 ERA and 14 strikeouts in 15.0 innings...was suspended for the final 10 games of the Arizona Fall League as part of a 50-game suspension that carried into 2016 for the use of a drug of abuse. Led all Cardinals minor league pitchers with 137 strikeouts and ranked 8th in strikeouts/9 IP (11.28)..ranked 5th in the Midwest League in strikeouts, 3rd in walks (61) and T1st in balks (3)...listed as the Top Prospect in the Midwest League...rated as the No. 2 prospect in the Cardinals organization by Baseball America...struck out 10 or more batters three times including consecutive starts (11 at Burlington 8/12 & 10 vs. Beloit 8/18). Rated as the No. 7 prospect in the Cardinals organization by Baseball America...ranked T3rd in the Appalachian League in wins (6), 5th in strikeouts (68), T3rd in games started (12) and 2nd in strikeouts/9 IP (10.49). 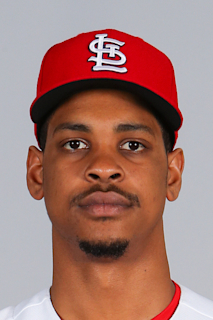 April 7, 2019 St. Louis Cardinals optioned RHP Alex Reyes to Memphis Redbirds. November 1, 2018 St. Louis Cardinals activated RHP Alex Reyes from the 60-day injured list. June 29, 2018 St. Louis Cardinals transferred RHP Alex Reyes from the 10-day disabled list to the 60-day disabled list. Right latissimus strain. May 31, 2018 St. Louis Cardinals placed RHP Alex Reyes on the 10-day disabled list. Right lat strain. May 30, 2018 St. Louis Cardinals activated RHP Alex Reyes from the 60-day disabled list. May 24, 2018 St. Louis Cardinals sent RHP Alex Reyes on a rehab assignment to Memphis Redbirds. May 19, 2018 St. Louis Cardinals sent RHP Alex Reyes on a rehab assignment to Springfield Cardinals. May 14, 2018 St. Louis Cardinals sent RHP Alex Reyes on a rehab assignment to Peoria Chiefs. May 9, 2018 St. Louis Cardinals sent RHP Alex Reyes on a rehab assignment to Palm Beach Cardinals. March 31, 2018 St. Louis Cardinals transferred RHP Alex Reyes from the 10-day disabled list to the 60-day disabled list. Right elbow injury. March 28, 2018 St. Louis Cardinals placed RHP Alex Reyes on the 10-day disabled list retroactive to March 26, 2018. Right elbow. November 6, 2017 St. Louis Cardinals activated RHP Alex Reyes from the 60-day disabled list. June 28, 2017 St. Louis Cardinals transferred RHP Alex Reyes from the 10-day disabled list to the 60-day disabled list. March 30, 2017 St. Louis Cardinals placed RHP Alex Reyes on the 10-day disabled list. December 19, 2016 RHP Alex Reyes assigned to Tigres del Licey. August 9, 2016 St. Louis Cardinals selected the contract of RHP Alex Reyes from Memphis Redbirds. July 12, 2016 Memphis Redbirds activated RHP Alex Reyes from the temporarily inactive list. July 8, 2016 Memphis Redbirds placed RHP Alex Reyes on the temporarily inactive list. May 22, 2016 Memphis Redbirds activated RHP Alex Reyes from the restricted list. April 7, 2016 RHP Alex Reyes assigned to Memphis Redbirds from Springfield Cardinals. November 9, 2015 Surprise Saguaros placed RHP Alex Reyes on the restricted list. November 9, 2015 Springfield Cardinals placed RHP Alex Reyes on the restricted list. July 22, 2015 RHP Alex Reyes assigned to Springfield Cardinals from Palm Beach Cardinals. July 18, 2015 Palm Beach Cardinals activated RHP Alex Reyes from the 7-day disabled list. July 13, 2015 Palm Beach Cardinals sent RHP Alex Reyes on a rehab assignment to GCL Cardinals. June 25, 2015 Palm Beach Cardinals placed RHP Alex Reyes on the 7-day disabled list. April 9, 2015 RHP Alex Reyes assigned to Palm Beach Cardinals. March 12, 2015 RHP Alex Reyes assigned to St. Louis Cardinals. April 2, 2014 RHP Alex Reyes assigned to Peoria Chiefs from Johnson City Cardinals. March 7, 2014 RHP Alexander Reyes assigned to St. Louis Cardinals. June 19, 2013 RHP Alexander Reyes assigned to Johnson City Cardinals. December 3, 2012 St. Louis Cardinals signed free agent RHP Alexander Reyes to a minor league contract.